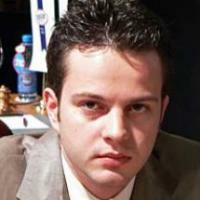 Frenchman Etienne Bacrot (pictured) won the Aeroflot Open in Moscow and so earned €70,000 and an invite to the Dortmund super-GM tournament in July this year. He did it the hard way, beating Armenian GM Arman Pashikian who was the leader going into the last round, with the black pieces. That meant Bacrot tied for first place on 6.5/9 with Ukranian GM Alexander Moiseenko, but Bacrot was declared winner on a superior tiebreak score to claim the title and Dortmund invite. The top placed woman was Tatiana Kosintseva of Russia on 5.5/9, and the top Junior was Wesley So who finished on 5/9. Tatiana's earned a GM norm with her impressive score; her only loss was to So in round 3.